Bury Castle in Cornwall, England. This Hillfort is near Higher Treslea about 1.5 miles NE of Cardinham. 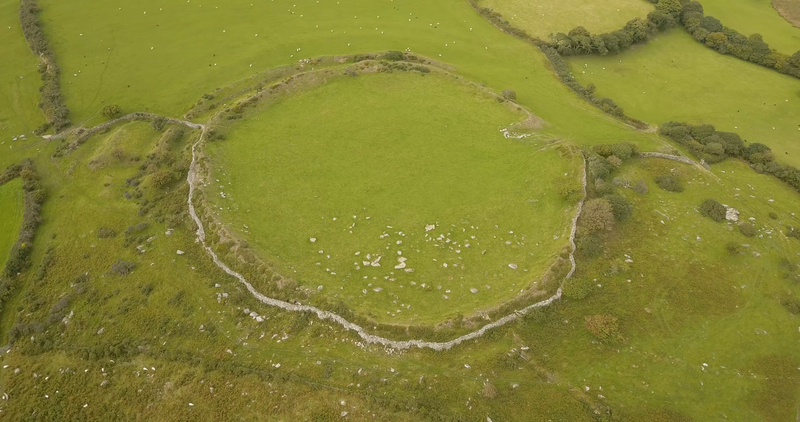 This Iron Age hill fort is almost circular with a diameter > 140 metres in the north-south axis. The ramparts are quite impressive, as in places they rise to about 4.3 metres. Situated on a south-east facing hill slope at 253m OD. In good condition. Multi-vallate hillfort on gently sloping hill one mile NE of Cardinham village. Oval in plan, approximately 600′ N-S and 400′ E-W. The inner rampart is nearly perfect with an entrance on the north east side. A sub-oval multi-vallate IA defended settlement situated just off the crest of a south-east hillslope. The main feature is a univallate enclosure of 1.5 hectares its rampart topped by an 0.6 metre high stone wall. This work is strengthened on the north side, which is on the level hilltop, by two extra banks and ditches; these terminate abruptly on the west and east sides. The east entrance which is now extensively mutilated was probably inturned and it is protected by two outer banks which are also mutilated. The interior which slopes to the east has numerous large granite boulders spread over its southern half but none form any identifiable pattern. A 1.6 metre high revetted bank and slight outer ditch which stretches from SX 13356977 to SX 13626983 effectively cuts off the approach to the settlement to the level north side. Two 0.5 metre deep ditches wind down the hill on the west side form SX 13356977 but these are probably hollow-ways from Little Bury farmstead. “Bury Castle” is the accepted local name. The principal rampart is up to 3.0m high and its ditch averages 1.0m deep. The inner of the two banks on the north side has been refashioned at some stage and is now 2.0m high. The outer work lies in a pasture field which is occasionally ploughed; the rampart and its ditch are still traceable being 0.5m high and 0.3m deep respectively. The west side of the hill fort is covered by dense vegetation; the terminals of the two outer works here have clearly been disturbed at some period and the exact nature and purpose of the two 0.9m high oval mounds are difficult to ascertain. Summary: Oval and complex, ‘multivallate’, partial contour hillfort located just off crest of SE-facing hill NE of Cardinham village. Oval in plan, c. 188m N-S and 125m E-W. Inner, and principal, well-preserved rampart, to c. 3m high, topped by c. 0.6m high stone wall, with ditch averaging c. 1m deep, forms a univallate enclosure of c. 1.5ha. Strengthened on N side of fort, on level hilltop, and effectively cutting off approach, by two extra banks and ditches, the outer ploughed, terminating abruptly on W and E sides. The inner of these two banks refashioned and now a c. 1.6m – 2.0m high stone-revetted bank with slight outer ditch, seemingly joined to site by another rampart to form an annexe, possibly indicating phasing to site. The outer bank lies in an occasionally ploughed pasture field, rampart and ditch still traceable at 0.5m high and 0.3m deep respectively. Two 0.5m deep ditches wind down the hill on W side, but these are probably hollow ways from Little Bury farmstead. NE entrance now extensively mutilated, probably inturned, and is protected by two outer banks, also mutilated. Interior sloping to SE has numerous large granite boulders spread over its S half, but none form any identifiable pattern. W side of the hill fort covered by dense vegetation; the terminals of the two outer works here have clearly been disturbed at some period and the exact nature and purpose of two 0.9m high oval mounds are difficult to ascertain. Dense scrub on part. No excavations to this disturbed, but generally well-preserved site. On 1st Ed. OS map (1882). Undated.